BEIJING, Jan. 1 (Xinhua) -- As gold, purple and silver fireworks lit up the sky over Sydney Harbor, Australia, along with other Pacific islands, first walked into the new year with millions of revelers wishing for a better 2019. From Kim Il Sung Square in Pyongyang to the Petronas Twin Towers in Kuala Lumpur, from the world's tallest building Burj Khalifa in Dubai to the Quadriga statue of the Brandenburg Gate in Berlin, colorful fireworks decorated the sky, under which similar new year wishes were made. "I wish I could stay healthy and taste the sweetness of life for as long as possible," said 71-year-old Tsewang, who lives in a nursing home in Lhasa, southwest China's Tibet Autonomous Region, on the first day of the new year. Though being short of the chance to see fireworks due to China's environmental protection policies, the Lhasa senior voiced a wish shared with people in other corners of the world. 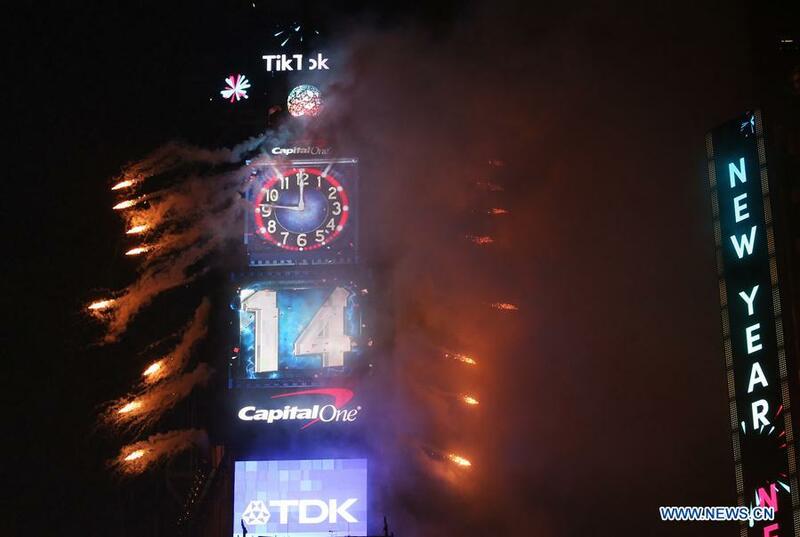 New York City's Times Square on Monday night embraced its first rainy New Year's Eve celebration in 24 years, with a traditional Chinese dragon dance kicking off the countdown at 6 p.m. (2300 GMT) in front of tens of thousands of revelers. Witnessing the ball drop in New York, one of the most celebrated traditions of the city on New Year's Eve, was especially thrilling for Louisiana citizen Benito Leon. It was a special occasion for him to reunite with his sister after she moved to Mexico 18 years ago. Across the world, celebrations of the new year were varied. Lovers kissed each other when watching the first sunrise of 2019 on a hilltop overlooking the city skyline of Seoul; foreign tourists cheered at superstar performances from Lady Gaga, Celine Dion and others on the eve in Las Vegas, the United States. Being together with loved ones is essential for a happy transit to the new year, as is wish making. "In the new year, I hope all my loved ones can be happy and stay healthy," Chicago citizen Alex Cuevas told Xinhua. Looking forward to a more stable job, the middle-aged man said his biggest wish for 2019 is to pay off his house he bought 15 years ago. In Malaysia, under the iconic Petronas Twin Towers in the capital city of Kuala Lumpur, Arshah Shahir joined the countdown on the eve, which also marked his 33rd birthday. "This coming year I wish always luck in my business and the best for my family and also for Malaysia," he said. As fireworks illuminated the sky above Kim Il Sung Square in Pyongyang, the capital of the Democratic People's Republic of Korea (DPRK), a group of drones flew up and formed the letters "Happy New Year." Joining tens of thousands of Pyongyang residents in the square, a university student who did not reveal his name told Xinhua that he wishes his motherland to be "stronger and greater in the new year." Domestic development, especially economic growth, was among the most mentioned new year wishes as it is also the key issue concerning the public most. Rafael Hernandez, a political science professor at the University of Havana, said Cuban President Miguel Diaz-Canel has prioritized economic growth in his agenda, and thus 2019 will see the possibility to complement a policy that can ensure foreign investment in tourism, infrastructure, transport, services and industry. Calling for more daring steps to promote the Cuban economy, another Cuban academic, Esteban Morales, said the island country should learn from China, which aimed to lift another 10 million poverty-striken rural residents out of poverty in 2018. "We should move on with economic reforms that guarantee the sustainability of the Cuban social welfare model," Morales added. Hopefully, the United States and the rest of the world could be better and enjoy peace, Peg Allen of Maryland told Xinhua in drenching Washington D.C. on New Year's Eve. She urged the U.S. government to "make more friends than enemies." In Paris, as a fireworks display and sound-and-light show under the theme "Fraternity" went ahead on the Champs-Elysees, "Yellow Vest" protesters stood among revelers on the famed avenue, with further demonstrations planned. In other parts of the world that are still trapped in wars and conflicts, people wish for peace or at least a lasting cease-fire deal. Basheer Ahmed, a Yemeni youth activist, is among them. Noting that the Hodeidah cease-fire deal signed in Sweden was "the only achievement made in 2018," Ahmed said he hopes the warring rivals push forward their discussions about "the country's political crisis" and end "the conflict politically." Speaking of wars, Brian Lantz, representative of the Schiller Institute, an international political and economic think tank in the U.S. city of Houston, shared his positive view with Xinhua when anticipating the first day of 2019. "The problems like warfare, like poverty, these problems that seemed intractable and unresolvable, can be solved," said Lantz, quoting the China model and the ability of China to lift 700 million people out of extreme poverty as proof.